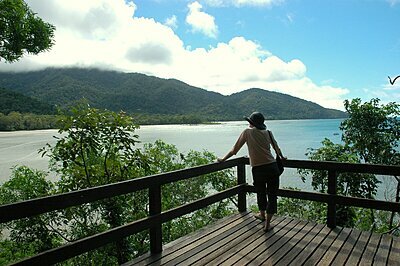 Cape Tribulation is at the end of the sealed road, 35 kilometres north of the Daintree River Ferry. North of Cape Tribulation the Bloomfield Track continues to Cooktown. It is suitable for 4WD only. Activities, tours and attractions - The rainforest can be explored by self-guided trails, guided walks, horse rides and even a flying fox. The reef can be visited for a half day, or you can paddle the coastline in a sea kayak and see where the rainforest meets the reef. Cape Tribulation is also home to 2 interpretive walks - Dubuji Boardwalk (a 1.8 km boardwalk through the forest and mangroves) and Maardja Botanical Walk (a boardwalk and pathway through the high value Daintree coastal rainforest). Maardja is 10 minutes south of town while Dubuji is off the main street and exits onto Myall Beach. Accommodation - A good range of accommodation styles exists in the valley from eco-retreats, mid range and budget resorts, bed and breakfasts, holiday houses, farmstays and camping grounds. Accommodation houses offer rooms, set in natural surroundings, with something to suit everyone. Services - most conveniences are available at Cape Tribulation. There are two small supermarkets, bottleshops, cafes ATMs, an interpretive Centre, a cinema and several restaurants all within walking distance. Driving north to Cape Tribulation there are great views to the east, over the Great Barrier Reef, and north to the Cape itself. The road was only put through to Cape Tribulation in 1962. The first person to drive to Cape Tribulation was Marion Swenson in an old, ex army, Bren gun carrier. She drove along Coconut Beach, across Myall Creek mouth (at low tide) and up into Mason’s property via the existing track to the wharf in Myall Creek. Later, the last section of road was completed, eliminating the need to drive on the beach. Equatorial climate - Cape Tribulation valley resembles a giant amphitheatre, with a semicircle of hills dominated by Mt Sorrow (850m) and Mt Hemmant (1000m). The southeastern rain, trapped by this valley, results in a tropical climate with high temperatures, humidity and rainfall - ideal for growing rare tropical fruit. Two farms at Cape Tribulation grow fruit normally found only in equatorial areas. There are opportunities to sample this fruit at a number of businesses in the area. Pioneers - The Mason family were the first white people to settle in the valley having previously had an unsuccessful farming venture at Cow Bay. They arrived in 1932 and tried many things, including farming fruit and vegetables, timber cutting and cattle. For many years Hayles’ boat was the only real transport in and out of the area, passing Cape Tribulation on the way to Cooktown, and then returning, later in the week, on the way back to Cairns. All produce was shipped out by boat: Masons had their own boats during the timber cutting era. Early tourism - Backpackers ‘discovered’ Cape Tribulation in the early 1980s and it became a part of the India-Goa-Bali trail. Its status as an icon was reinforced during the 1982 - 84 Bloomfield Road protests that led to World Heritage listing in 1988. The first accommodation, ‘Pilgrim Sands’ (1977) was located on the site that is now Cape Trib Beach House. The first local tours were Mason’s Tours in 1981.